Andrea Landini grew up in one of the most tumultuous periods in nineteenth century Italy. Until the early part of the century when Napoleon took control of most of the Italian peninsula, there was no unity among the diverse duchies, kingdoms and republics that comprised what would later become the nation of Italy. Napoleonic rule meant that a new penal code was established, medieval feudal systems were abolished and commercial business within the Empire’s boundaries was encouraged; the Inquisition was disbanded and the ghettos were opened so that Jews had full civil rights. [i] For slightly less than a decade, this imperial regime provided a glimpse of how a modern nation state might be organized. After it all fell apart at the battle of Waterloo in 1815, the Congress of Vienna “carved up Italy again into territories for colonization.” [ii] Not surprisingly, this led ultimately to the Risorgimento, the movement for the resurgence of Italy as a powerful nation in its own right. By the time of Landini’s birth on December 10, 1847, the Risorgimento was underway. Reformers took various political stances, but all were dedicated to the ideal of an independent and unified Italy. By mid-century, Giuseppe Mazzini (1805-1872) and Giuseppe Garibaldi (1807-1882) had emerged as revolutionary leaders, both advocating for the independence of Italy and the establishment of a republic. In January 1848, the first wave of revolution broke out in Sicily, followed quickly by a similar insurrection in northern Italian states, but it was short-lived, falling to the forces of the Austrian Empire in 1849. Garibaldi and Mazzini both fled Italy, to New York and London respectively. Throughout Landini’s childhood in Florence, the political situation continued to simmer, and his hometown became increasingly involved in the conflict. Garibaldi returned to Italy in the spring of 1860, leading a force of 1000 men to Sicily where they began a military campaign that resulted in the creation of the Kingdom of Italy in March 17, 1861; Victor Emmanuel II, who had led the military campaign in the Papal States surrounding Rome, was declared king. By 1865, Florence was proclaimed the new capital of an independent and unified Italy. It was not until 1871, when the Franco-Prussian War broke out in France, that the capital moved to Rome. Against this volatile backdrop, Landini began to study art at the Accademia di Belle Arti (Academy of Fine Arts), probably in the early 1860s, with Professor Antonio Ciseri (1821-1891), a Swiss-born painter of religious subjects. Ciseri himself had moved to Florence in 1833 to study drawing and subsequently studied painting with Pietro Benvenuiti, then the director of the Academy. His work is solidly grounded in the classical tradition of Raphael, although it is executed with photographic precision. This same attention to exacting detail is seen in Landini’s work, such as an early canvas showing an Italian bride and a notary. Set against the backdrop of a well worn arched stairway, the figure of the bride stands out in a lace-trimmed white shawl over a ruby satin blouse. The subtle chiaroscuro of her face and neck reflect the Renaissance conventions of Florentine painting. Landini most likely also honed his skills as a portrait painter in Ciseri’s studio. Like his mentor, the artist paid close attention to the details of costume, setting and fabric in his portraiture. The 1884 canvas, Portrait of a Woman, illustrates this meticulous work clearly; although the sitter is a somewhat plain woman, Landini portrays her with great dignity, detailing the exquisite lace of her overskirt and the luster of her pearls. Often working on life-size portraits, his commissions included a number of aristocrats including the Countess di Pralormo, the Laparelli-Pitti family of Florence and the Princess of Wales. This may be explained, in part, by the Landini family’s deep roots in Tuscany where the Landini heraldic crest is seen in Florentine churches dating as far back as the thirteenth century. This suggests that the Landini family were property holders during the medieval period. Landini’s work as a portrait painter established his career in Florence, and eventually he expanded his scope to include exhibitions in Paris as well. It seems to have been in Paris that he began to develop his best known specialty—genre paintings of Catholic clerics indulging their all too human foibles. Like many of his French counterparts, Landini’s earliest genre paintings were of cavaliers in eighteenth century period costumes, typically bemoaning the absence of a lover or engaging in a romantic tryst. 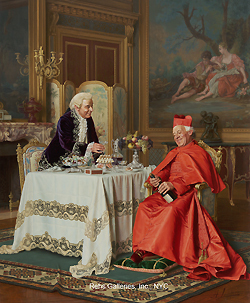 In contrast, the paintings of Catholic cardinals and bishops are entirely contemporary although these scenes are invariably set in baroque and rococo palaces. In Italy, the genesis of these anticlerical images may have had an equally political source. 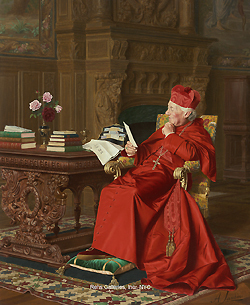 As art historian Albert Boime pointed out, “Napoleon’s treatment of the Church made it clear that the possession of temporal power was not a necessary condition for the performance of the Church’s spiritual function.” [v] Given the large number of cardinals in Rome, no doubt their shortcomings would have been more visible to the public as well. Landini exhibited his work in Rome and certainly traveled there for extended periods of time, although it’s not clear whether he was first inspired by witnessing clerical behavior or by seeing the work of his French colleagues such as Jehan--George Vibert (1840-1902) or François Brunery (1849-1926). Landini’s paintings of cardinals are primarily set in elaborate rococo palaces, suggesting strongly that they were painted in France. The gilded stucco work, the boiserie with inset mural paintings and the parquet floors all identify these large and elegant spaces as French eighteenth century design. Further, the murals on the walls are painted in the style of François Boucher (1703-1770), and, it must be noted, they are not at all biblical in their subject matter. In fact, these settings are extraordinarily luxurious and it is here that the cardinals enjoy their champagne and abundant food, toasting each other as well as their chef. The humor is good-natured, but also pointed. The cardinals enjoy an opulent life in the palace while the people suffer in the industrial cities of the nineteenth century. Landini had considerable success exhibiting at the Paris Salon as well as in Florence and Rome. His paintings, especially the satirical images, were popular with the ever-expanding middle class market for art. In general, these canvases were relatively small in size and therefore, more affordable than either a large portrait or a history painting. The opening of the United States art market was also a factor in Landini’s success. The vast majority of his works remain in private collections today. Little is known about Landini’s last years beyond the fact that he exhibited at the Paris Salon in 1911 and again 1929. As a foreign national, he would have been asked to return to Italy during World War I, and presumably continued to paint there until his death in 1935. [i] Albert Boime, The Art of the Macchia and the Risorgimento (Chicago: University of Chicago Press, 1973) 20-21. [iii] Elena Landini-Ruffino, Valeria (Firenze: Stabilimento di Giuseppe Divelli, 1878). [vi] There are many sources that discuss the implementation of democratic principles under the Third Republic in France. For an art historical perspective on these issues, see Richard Thomson, Art of the Actual, Naturalism and Style in Early Third Republic France, 1880-1900, (New Haven, NJ and London: Yale University Press, 2012).